Energy sector fund has outperformed other sector equity fund for the past 3 years. The following Vanguard Energy fund is among the best rated energy sector stock fund. Details about the fund can be found below. The Vanguard Energy Fund seeks long-term appreciation of capital. This Vanguard fund invests >80% of its assets in the energy industry companies with engagement as production and transmission of energy or energy fuels; the making of component products for such activities; energy research; and energy conservation. It may invest <100% of its assets in foreign stocks. This Vanguard Energy fund has a 0.34% annual expense ratio. This fee is much lower than the average expense fee in the Equity Energy category which is 1.65%. The fund’s lead manager is Karl E. Bandtel since December 2002. This fund was introduced to public in May 1984. As part of no load fund, this best rated fund doesn’t have a sales load fee and a management fee. This VGENX fund receives five stars rating (i.e. 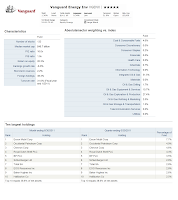 the highest rated fund) from Morningstar. 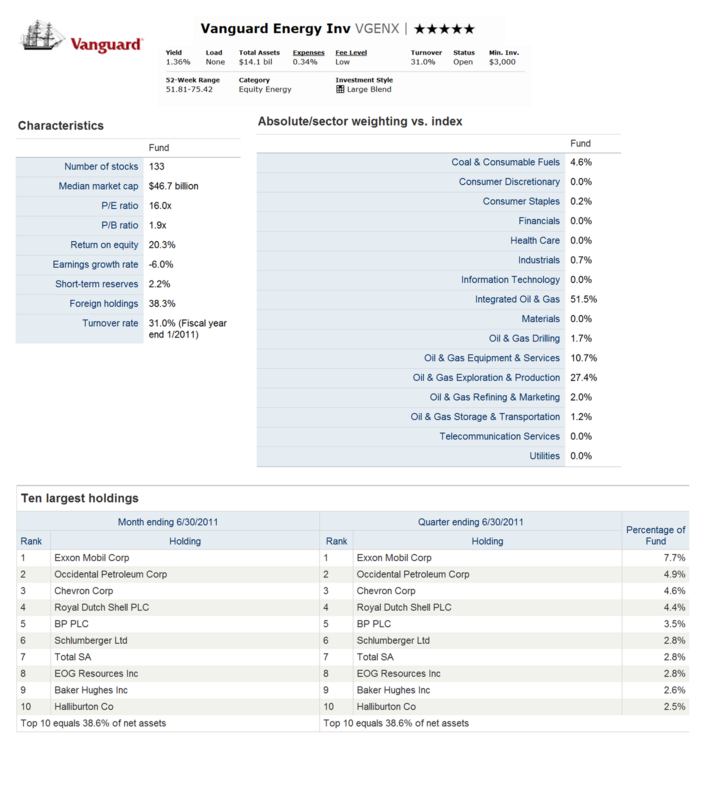 This Vanguard fund is also featured in the best rated stock fund in Energy sector by U.S. News magazine. This energy sector stock fund has returned 15.57% over the past decade, 6.78% over the past 5 years and 45.57% over the past year. The fund has its best performance year in 2005 with 44.60%. Its worst performance return occurred in 2008 with -42.87%. This Vanguard fund has a YTD return of 9.98%. The benchmark of this mutual fund is MSCI ACWI Energy. For investing in the regular brokerage account of this fund, you will need $3,000 minimum balance with $100 minimum subsequent investment. This same amount applies for IRA account. This top sector fund is available to many investors. Investors can purchase this fund through 73 brokerages. They are T Rowe Price, JP Morgan, E Trade Financial, Sun Life CPS, Hartford CPS, Vanguard NTF, Royal Alliance, Raymond James, Schwab Retail, Federated Trust Connect, etc. This mutual fund is also available in Admiral Class (VGELX) with the minimum initial investment of $100,000. This Vanguard Energy Fund Admiral has an expense ratio of 0.28%. The top absolute/ sector weightings of this fund as of June 2011 are Integrated Oil & Gas (51.5%), Oil & Gas Exploration & Production (27.4%), Oil & Gas Equipment & Services (10.7%), Coal & Consumable Fuels (4.6%). The top 10 holdings of this fund are Exxon Mobil Corp, Occidental Petroleum Corp, Chevron Corp, Royal Dutch Shell PLC, BP PLC, Schlumberger Ltd, Total SA, EOG Resources Inc, Baker Hughes Inc and Haliburton Co. These ten companies equal 38.6% of total net assets.